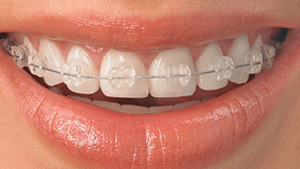 Orthodontics is the art of using appliances to straighten and align teeth. It involves the use of braces to move teeth into their proper positioning. In this method, the brackets are bonded, or glued, to the teeth and arch wires are threaded through the brackets. The arch wires act as a track and guide each tooth into proper position. Teeth, and sometimes entire facial structures, are permanently changed by orthodontic treatment. Teeth in correct alignment are easier to clean, which can make them more resistant to decay and less susceptible to gum disease and tooth loss. Properly aligned teeth can also help distribute bite forces evenly to help prevent chipping and fracture. We offer several orthodontic options for both adults and children, including clear bracket alternatives, short phase orthodontic treatment, Clear Correct, and Invisalign. Dr. Austin Westover is trained in a progressive field of orthodontics referred to as either Functional Orthodontics or Neuromuscular Orthodontics. Our goal in moving teeth is not just to create a beautiful smile, but to position the teeth and jaws in a position that is harmonious to the jaw joints, airway, and craniofacial structure. This type of treatment minimizes the future risks of TMJ disorder and sleep apnea by decompressing the jaw joints and opening the airway. Many times we are able to treat either sleep apnea or TMJ disorder using orthodontics. We generally avoid extracting healthy permanent teeth and create customized, individual treatment options for both children and adults.